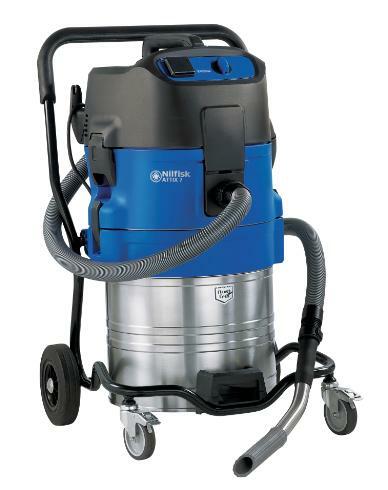 ATTIX 7 is perfect for users who need a big capacity and highly efficient vacuum cleaner with a robust steel chassis. This model has a high suction power with a low noise level. ATTIX 7 is a genuine solution for professional use within wet and dry applications. ATTIX 7 is designed with a 70 liter container which allows you to work for a very long time without emptying the container, and when it is necessary, you will find the Tilt or Lift-Off container system extremely convenient and time-saving. If your vacuum cleaning tasks are "high volume", you are sure to find a perfect match for your task in the ATTIX 7 range. Operating costs are minimized with the washable PET fleece filter elements, and the low working noise level lets you work when others are nearby, without disturbing them. Automatic On/Off models are the choice for people who use the vacuum cleaner with electric hand tools because starting or stopping the tool automatically starts and stops the vacuum, as well. An accessory Airbox is available which performs the same function when using pneumatic tools.